GOOGLE ATTRIBUTION · 7-MINUTE READ · By Misty Faucheux on June 19 2017. In May, Google announced that it was doing away with last-click attribution. In its place, Google will now be offering a new reporting product, known as Google Attribution. The goal of this new product is to provide more sophisticated insights into overall campaign performance. Yet, the removal of last-click attribution is giving many marketers a bit of a complex. Before diving into how Google Attribution works, it’s worth reviewing why marketers are anxious over this latest change. Every time someone performs an action on your website, that action is attributed to a particular campaign. AdWords, DoubleClick, etc. determines which campaign gets credit for a lead, sale, asset download, etc. For most of Google’s and many other analytics platforms’ history, the credit was always given to the last touchpoint. This is known as last-click attribution. Let’s take this example. You are running multiple campaigns targeting the same set of targets: email, social, paid search and organic. A user first saw a paid search ad for your product. Then, he came to the site via an organic search engine result, but didn’t make a purchase until he clicked on a link in an email. Despite these different channels working together to finally make the sale, with last click, only the email campaign would get the credit for the sale. Yet, the other two channels clearly assisted with the conversion. The visitor probably wasn’t ready to buy when he first saw the ad, which resulted in additional research. The email was simply the final trigger in the decision-making process. All these channels were important in the sales process, but email was given the credit because it was last. With the current models, marketers would assume that the email campaign was the sole reason for the conversion. You’d have to dig into the Assisted Conversions or Top Conversion Paths sections of Google Analytics to see that your other campaigns were performing well and how they were assisting with converting visitors. Many marketers see last-click attribution as the sole reason why a visitor decided to take an action. Honestly, it makes judging campaigns simpler. If you can say that a particular ad from a particular campaign resulted in the conversion, then you can create similar ads/campaigns/messaging to increase your conversions. It makes reporting easier, especially in terms of successes and failures. That way of thinking, however, isn’t taking into account the supporting players that might have actually had more of an influence on the success of the campaign than the final act. Why Did Google Decide to Move Away from Last Click? Google has consistently tried to improve metrics to make them more useful to marketers. As mentioned previously, last click only gave credit to the final channel. Previous channels, however, may have assisted top-of-the-funnel activities like research, brand awareness, etc. A recent article indicated that it can take 30 or more touchpoints before a visitor makes a transaction. This means that the first interaction might have been just as – or more – important that the final one. Google wants to ensure that marketers are seeing the full picture of how their marketing dollars are being spent – and help them understand which clicks have the most impact on results. The new Google Attribution model leverages machine learning to give a weighted value to each of the different touchpoints. This is a data-driven model designed to provide better insights in overall channel campaign performance. Data-driven models review all converting and non-converting paths, and give credit to the different touchpoints. While multi-channel funnel attribution has been around for years, the new product – according to Google – will be faster and provide more in-depth details. It will take some time to understand how Google weighs each conversion. 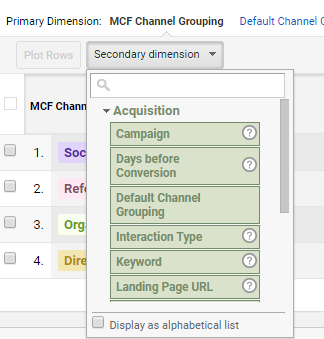 You might find it helpful to add secondary dimensions, including AdWords keywords, landing page, source, etc., to get more granular detail into what assets contributed to the conversion path. Google can pull in a variety of dimensions, adding more granular data to the overall metrics. Google Attribution provides streamlined insights into overall campaign performance. You can pull in both online and offline data to create a comprehensive model of how campaigns are working together – or against each other. For example, you can upload offline conversion and cost data, and then this data will be added to the overall model. Then, adding in the weighted conversion path data, you can see which campaigns eventually led to the offline purchase. Google Attribution makes it easier to justify the effectiveness of specific campaigns to stakeholders. In the past, a particular channel may have looked like it was failing, but it might have been supporting other campaigns. It was difficult to dig into this data even though multi-channel funnel reports have been available for a while now. Before using Google Attribution, however, think about how you’re going to report on these new insights. If you’ve only ever reported on last-click attribution, your stakeholders will more than likely need a bit of training to understand the shift. Set up your reporting template with the new data, and be prepared to make changes as needed based on stakeholder feedback. Also, experiment with the product. Since it’s extremely new, there are bound to be quirks and potentially data that you might not fully understand. Spend some time reviewing and thinking about what’s being reported. It will not only help your own learning, but also help you justify your reports when the inevitable questions arise.